Is Postcode Bingo a Scam or Legit? Read Reviews! Postcode Bingo Exposed — What Can You Win Here? Our team reviewed Postcode Lottery, now it’s a right time to review Postcode Bingo. I remember as a kid going to play bingo at the local community center. Clicking on Postcode Bingo puts a big smile on my face as there I was a kid again. PostcodeBingo.co.uk offers a bunch of different ways to play bingo plus instant scratch cards and other games. And then I remembered that this isn’t simply buying a few bingo cards to play so I’d better take a look at the rules and regulations of this online games site. Let’s start with their straightforward bingo games of 75 Ball Bingo, 90 Ball Bingo and High 5 Bingo. These have a flat jackpot based on getting 1, 2 or 3 lines and a full house. They are played every 3 to 5 minutes, depending on how quickly someone wins. Players can choose to “daub” on their numbers or auto-play (which does it for you). Their system does it anyway, just in case you lose your connection. The game pauses when someone one gets bingo and then restarts until the set number of balls is drawn. Players can choose 1 to 96 cards to play. There must be a minimum of three players for the game to be played. There are other games to play where the jackpot continues to grow until won. Diamonds Are Forever (75 ball bingo) is played 7 days a week, every 30 minutes (2 hours a day) with a jackpot starting at $/€/£500. I don’t get the multiple currency here, though digging through the terms, it looks like you win the currency that you’ve paid into your account. House Party is their 90 ball bingo progressive game with a jackpot starting at $/€/£100 played 24/7. Swedish Jackpot is the High 5 Bingo progressive game. Winning takes getting a full house within a certain amount of numbers called. Add to this the Coverall Jackpot played every 30 minutes at certain times every day. This bingo game has the potential of getting up to some bigger jackpots. Then there are their Featured Games which are a heap of slots games and scratchies. What Bonuses Postcode Bingo Offers? Players get a 200% bonus on their first deposit. The minimum is £10. There also seems to be some re-deposit bonuses of 100%. But keep in mind, if you win playing with bonus money, that amount you get in real cash and can take home is less the bonus money played (which is re-deposited into your bonus money account). It took me a bit to get my head around that one. If you play £10 from your bonus money and win £500, then £490 goes into your real money account and £10 goes back into your bonus money available for play. 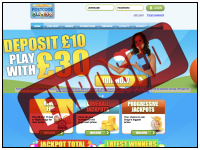 “Invite a Friend” and you can get £10 bingo bonus money up to 15 people per month. Your friend must deposit a minimum of £10 and play within 14 days. Loyalty Points Scheme accumulates on each bingo card purchase with real money (versus using bonus money). 1000 loyalty points converts to £1 bonus money. Jackpots are paid out over 24 months with the first installment of 20% and the remainder divided by 23. You can only withdraw money through whatever you used to deposit to your account. Who Can Play at Postcode Bingo? I started getting really excited about playing here. PostcodeBingo.co.uk looks like fun and then I read the small print. This is only for UK residents and if you’re located in Antigua, Belgium, Denmark, France, Gibraltar, Israel, Italy, Spain, Turkey or the United States this is a non-starter. Oh, and you have 72 hours to verify you are 18 years or older or your account will be frozen. Their helpline through your account is open 24/7. Email responses can take up to 72 hours. There is also a toll free number for in the UK available 9:00 am to 1:00 am GMT daily. Postcodebingo.co.uk is owned by Cassava Enterprises (Gibraltar) Limited licensed out of Gibraltar. They are owned by 888 Holdings PLC, listed on the London Stock Exchange. What is weird is PostcodeBingo.co.uk isn’t listed on their brand’s site. There is a snail mail address in Gibraltar. Would you mind rating PostcodeBingo.co.uk? This isn’t going to involve winning one of the mega lotteries and the fact that jackpots are paid over a 24 month period is a little weird. At the same time, it looks like it could be fun. This site gets a tentative thumb’s up. If you’re playing here, please give me your feedback. I’m not sure how they manage all the different times for games and what happens if there are less than 3 players.